Calvin Lamar Pace (born October 28, 1980) is an American football outside linebacker who's currently a free agent in the National Football League (NFL). He was drafted by Arizona Cardinals in the first round (18th overall) in the 2003 NFL Draft. He played college football at Wake Forest. Pace attended Lithia Springs High School in Lithia Springs, Georgia from 1994 to 1998. In 1999, Pace played in seven games, and ranked 27th on the team in tackles. For the season he recorded four tackles, two for a loss, two sacks and one pass deflected. In 2000, Pace finished fifth on the team with 50 tackles (33 solo), including 12 tackles for a loss and nine sacks. In 2001, Pace finished sixth on the team recording 62 tackles (36 solo), including 18 tackles for loss and 10 sacks. He recorded one pass deflected and 11 quarterback hurries. In 2002, Pace finished third on the team with 73 tackles (43 solo), including 22 tackles for a loss and eight sacks. He recorded six passes deflected and four quarterback hurries. While at Wake Forest, Pace was a two-time Second-team All-ACC selection and finished his college career with 189 tackles, 29 sacks, five forced fumbles, and a fumble recovery. Pace was selected by Arizona Cardinals in the first round (18th overall) in the 2003 NFL Draft. In 2003, as a rookie, Pace started all 16 games. He recorded a total of 32 tackles and one sack. In 2004, he played in 14 games, recording 12 tackles and 4.5 sacks. In 2005, Pace played in only five games with one start. His season was ended when he suffered a laceration of his arm during the Cardinals bye week. Before Pace was placed on injured reserve he recorded 11 tackles and one sack. In 2006, Pace played in all 16 games, starting five of them. He recorded 29 tackles and one sack. In 2007, Pace was switched to outside linebacker and started all 16 games. He led the team with 106 tackles. Pace also recorded a career-high 6.5 sacks and one fumble. In his five seasons with the Cardinals, Pace played in 67 games with 38 starts recording 186 tackles, 14 sacks and 11 passes deflected. While with the Cardinals he also set career highs in tackles, sacks, interceptions, passes deflected and fumble recoveries in 2007 with 106 tackles, 6.5 sacks, six passes deflected, two fumble recoveries, one forced fumble and one interception. Pace at the Jets 2009 training camp. Pace wearing the Jets' alternate jersey during the 2009 season. Pace was suspended for the first four games of the 2009 season by the NFL after testing positive for performance-enhancing drugs. In the 12 games he played, Pace recorded 55 tackles, 8 sacks, and 3 forced fumbles. The Jets finished 9-7 and made it to the AFC Championship Game before losing to Peyton Manning and the Indianapolis Colts, falling one game short of the Super bowl. In August 2010, Pace injured his foot during the preseason. 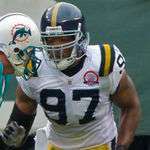 After missing the first four games, Pace started the remainder of the season recording 51 tackles, 5.5 sacks, one interception, and one forced fumble helping the Jets finish 11-5 and advance to the AFC Championship Game for the second consecutive year before losing to the Pittsburgh Steelers by the final score of 24-19. In 2011, Pace played all 16 games with 53 tackles, 4.5 sacks, 1 interception, 2 passes defended, 1 forced fumble, and 1 fumble recovery. In 2012, Pace played all 16 games with 35 tackles, 3 sacks, 2 passes defended, 1 forced fumble, and 1 fumble recovery. Pace was released from the Jets on February 19, 2013. He was re-signed by the team on April 16 to a one-year contract. During the 2013 season, Pace played all 16 games with 37 tackles, 10 sacks, 3 passes defended, and 2 forced fumbles. The Jets re-signed Pace to a two-year, $5 million contract on March 16, 2014. On September 13, 2014, Pace was fined $16,537 for a roughing the passer penalty during Week 1 against the Oakland Raiders. Pace resides in Warren, New Jersey. ↑ Lange, Randy (19 February 2013). "Five Are Gone, but 'They'll Always Be Jets'". New York Jets. Archived from the original on 19 February 2013. Retrieved 19 February 2013. ↑ Orr, Conor (16 April 2013). "Jets bring back OLB Calvin Pace on 1-year deal". The Star-Ledger. Archived from the original on 16 April 2013. Retrieved 16 April 2013. ↑ Hanzus, Dan (March 16, 2014). "Calvin Pace agrees to two-year, $5M contract with Jets". NFL.com. Retrieved 2014-03-16. ↑ "Celebrity Pizza Picks: New Jersey-based celebrities dish about they favorite pizza joints around the state". New Jersey Monthly. Morristown, NJ. 12 January 2010. Retrieved 19 April 2016.